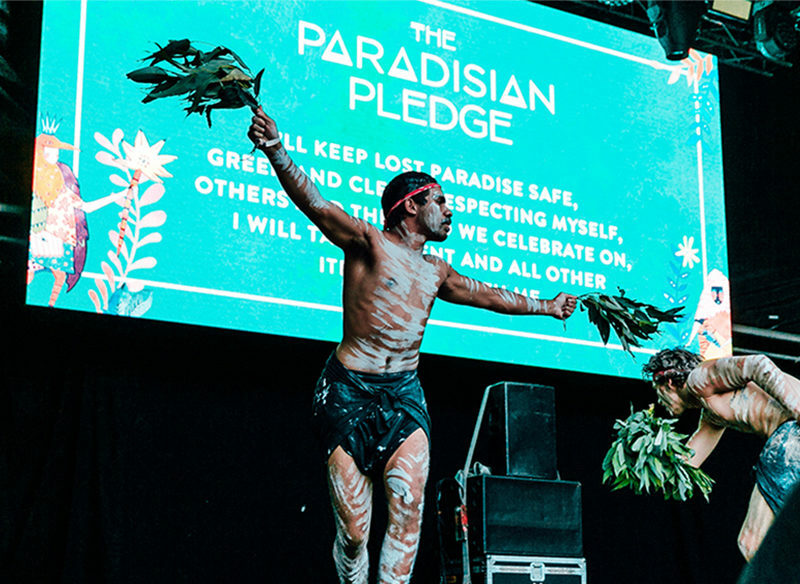 Held annually over the New Year’s Eve break, Lost Paradise is Australia’s answer to an eco-minded music festival filled with a quirky community spirit. It’s this drawcard that has found devoted Paradisians returning year after year – each time with higher expectations. Tickets to paradise are sold as four-night and three-night, even though the main line-up and activities only go for the latter three. But you know what they say – the early bird gets the worm – so we pitched our tent for all four nights, meaning we had a huge choice of camping spots, time to settle into our surroundings and a well-deserved swim in the creek before flocks of people arrived the following day. And if that isn’t enough to get you there early, Red Bull Music was pumping up the Lost Disco stage well into the first night, giving us a taste of was to come over the next three days. Following a first-night warm up, the rotation on the following days did not disappoint either. International superstars like The Kooks, M.I.A, Joey Badass more than impressed, sharing the stage with local legends Vera Blue, Tash Sultana and PNAU. None other than Canberra locals Peking Duk were there to help us count in the New Year with an acoustic rendition of their massive single Take Me Over, and the party started shortly after with fireworks, beats and boogying lasting well into the night. For those who were seeking the solitude of smaller crowds, there was a choice of cosier stages ready to give us a dose of much-needed shade and chill beats. The Barcardi El Coco dancerteria stage provided a little slice of tropical paradise and magical mojitos to keep everyone feeling refreshed while we waited for the sun to set. For many, the unique thing setting Lost Paradise apart from the growing number of boutique Australian festivals is the eclectic wonderland that is Shambala Fields. Here, Paradisians can take some time out from the main stages and centre their mind, bodies and spirits among Mother Nature. Not even the 40 degree days could stop the eager turn-out for the restorative yoga, meditation and dance workshops; some tents were spilling out the side with people ready to move to a mix of Latin and African sounds or reinvigorate themselves with a holistic mediation practice. One of the most humbling experiences was witnessing the festival’s dedication to incorporating and showcasing the culture of First Nations peoples. Keen attendees were able to take part in cultural workshops and yarns with elders, whose sacred lands we were walking on, as well as learn traditional dances and songs. Lost Paradise also incorporates an indigenous element. Image via Jordan Munns. The opening ceremony performed on the first ‘official’ night of the festival was yet another demonstration of how Lost Paradise strives to respect the First Nations peoples and make learning about their culture accessible and interactive for all festivalgoers. In true festival fashion, Lost Paradise is not one to shy away from a theme or fancy dress. New Year’s Eve was no exception, with the theme being ‘Cosmic Carnvale’ – think lights, glitter and silver space creatures galore. It felt like being on another planet with everyone embracing the chance to be who they wanted and gave us a much-needed break from the outside world. Another costume that caught my eye was the Earth Warriors roaming around in camouflage gear and gold-painted rubbish picks, looking like a team who were born ready for combat. They could be seen every day fighting the war on waste one piece of rubbish at a time, helping restore the site back to its previous glistening oasis-like state. I left Lost Paradise feeling exhausted and a bit rough around the edges – but I also left with the feeling of exaltation that only dancing in a forest, away from the bustle of city-life can bring. A blissful start to the New Year I could do time and time again.